Back on April 15th, I commented that it would be good to have a voice plan to go along with B-mobile's data-only FAIR SIM. 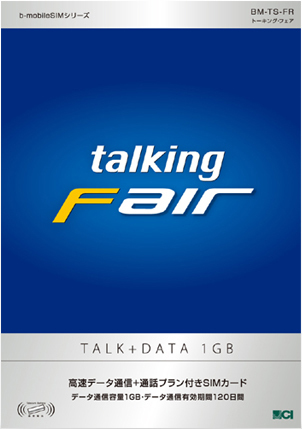 And here it is - today, JCI announced the Talking FAIR SIM. Because this is a traditional circuit switch/packet switch SIM, I expect it will have much improved compatibility with Android phones (See here for some issues regarding data-only SIMs). It will be available from August 2nd in both fullsize and iPhone 4 micro versions and is exactly like the prepaid data-only version that I have been using, but with the addition of a postpaid cellular voice plan. 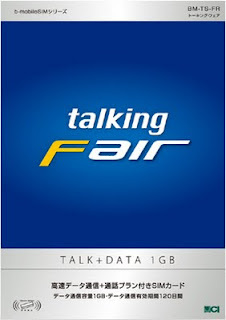 The Talking FAIR provides 1000 MB of data that can be used over 120 days with a maximum of 32.5 cellular minutes per month included at a minimum of ¥3,500 per month. However, this is the first b-mobile product that requires a contract, though the terms are much better than what is standard in Japan: only 1 year and no automatic renewal. This SIM is not for heavy users. Below are the details, which I've also added to the b-mobile comparison table. After canceling service, remaining data can be moved over to a data-only FAIR SIM for the cost of issuance of a new SIM (¥1,050) but it doesn't look like an existing charge on a FAIR SIM can be moved to a talking version. To the left in the sidebar, you can see a daily updating graph of my data usage with the data-only FAIR SIM. Because I am around wifi for most of the day, 1 GB is easily lasting me for the full four months using a Nexus One. However, I also have to carry around a second phone for voice, the ht-03a which has a "value ss" plan - the smallest/cheapest one Docomo offers. So, even though I personally consume very little bandwidth and very little cellular airtime, I was paying Docomo about ¥7,000 per month before getting the FAIR SIM, with most of this going towards unlimited data that I neither needed nor fully utilized. Now, after shutting off data on the ht-03a, I am paying the equivalent of about ¥4,000, with about half going to b-mobile for data and half to Docomo for voice. If I completely cancelled my Docomo contract and went with the Talking FAIR SIM, I would be paying just under ¥3,500 per month for both voice and data all on my Nexus One (not including contract fee and higher cost of first 1000 MB). While the MIC is getting more doing more lately with consumers in mind, carriers here still get away with crap that would be unthinkable elsewhere, like 2 year automatically renewing contracts. You have a one month window to cancel service for no extra fees, and that window comes 'round once every two years. Best to visit your local shop in advance and confirm exactly when you can cancel. And do the math. If canceling all extra services costs, for example, ¥1,500 per month, it is cheaper to not cancel service if you only about half a year or less left on your contract. Just turn off the phone and don't use it, though you won't be able to do MNP with the contract still active. Another solution to combine those prepaid data SIM cards with some kind of voice plan would be to use dual SIM capable phones. Unfortunately Android is very lacking in this area. The only available dual SIM android handsets seem to be low quality/bottom tier Chinese ones. And as far as I know stock Android doesn't even support the feature, dual SIM capability has probably been hacked in specifically for those Chinese models. For permanent resident, this new Talking FAIR SIM is of course an option. For travelers, a dual SIM phone would be a better solution (you keep your regular number for calls and SMS but avoid the prohibitive data roaming cost by using a U300/Fair SIM). Carriers generally hate dual SIM phones since it gives consumers more freedom/options to mix and match plans and they make it easier to escape roaming fees. Naturally, carriers won't be the ones pushing for that feature to be included in Android. great news! a solution for getting to the goal of carrying one sim-free device for both data and voice...a couple weeks late here, though, as I went ahead and got a wimax portable wifi device to deal with data...currently using an unlocked att&t Atrix with a Uroad wifi device via j:com (only 3600 / month). carrying around/charging two devices is kind of hassle (luckily they use the same battery charger), but the download speeds are pretty great. and the price is still far cheaper than what i was paying for docomo data. It will be interesting to see whether Docomo will change their product offering and/or pricing as an MVNO (b-mobile) is now offering a product that is -for some users- more attractive than Docomo's offering. A one-year contract, the possibility of tethering on the Docomo network and voice are compelling arguments for me to switch from Docomo to b-mobile, but I will still wait until I can switch without paying the early termination fee. I already learned that in order to sign up with them, one needs an email address (and/or a phone serial number) from either of Docomo, Softbank, or au. Is this information still correct? If I take my iPhone to Japan and pop in a B-Mobile SIM, I wouldn't be able to sign up. I'm on mixi. At the time I signed up, you actually needed an invite, I believe. Now you don't. You need a cell phone, but I don't know if you need one for the email address or the phone number. If it is only the phone number, then it doesn't matter because numbers are portable. If you need it for the mail address, then b-mobile would be a problem. By the way, I never use mixi. I think you overestimate. twitter is very popular here. Yes, I'm looking forward to seeing if Docomo lifts extra monthly charges levied on non-Docomo phones for data usage on the standard apn. It seems reasonable that they would with competition like this emerging. But then again, the biggest of the big doesn't necessarily have to be "reasonable" (offer a competitive price structure) when they have so many loyal customers already - and indeed, the free calls to family members (on docomo, of course) will keep many (including myself) with docomo. Not many of my friends seem to post anything on Mixi these days, twitter and to some extent facebook seem much more popular. What do you suggest to me ? Thank you for this blog it is very helpful for knowing more about phone providers in Japan ! Get the talking fair. It is less expensive, but not by too much, but the contract is not automatically renewed. If you are here for only 1 year, it will take a little while to get a resident card, which you'll need to get a SIM. So, you will probably be leaving before the contract ends. If you aren't in the country, canceling with docomo, SBM, or AU can be difficult if not impossible. B-mobile is all done through a webpage, so there is nothing that should prevent you from being able to cancel, even if you leave Japan before the 1 year contract finishes. O/S samsung should work no problems. I understant that Talking FAIR is cheaper, but is it still cheaper considering that I have to pay 50,000 yen here for the GalaxyS2, how much would the S2 cost me with Docomo ? And suppose I could cancel with Docomo ... what would be the billing plan ? how much should I pay for the phone and/or monthly ? Or could I buy just the phone alone from Docomo or somwhere else and how much will it cost me ? Finally, I decided I'm gonna get it from Japan and get the b-mobile Talking FAIR. Another thing to consider is that, while cheaper, purchasing and recharging the b-mobile SIM will be very difficult if you don't have excellent command of written Japanese. Yeah, I sometimes forget what it's like not to have any Japanese ability, but having said that, it isn't so bad. Buying can be done at retail stores, so that should be no problem. You'll have to use some Japanese to enter your credit card on the site, but it is very simple. Click the クレジットカード link at the top and fill in the form. It is pretty easy to tell what info goes where. Recharging can be done through the bcharge app, which is bilingual. Wow, thanks. The app will sure help. Do you (or anyone) know if I get the data only SIM at a retail store while fresh off the plane then add the voice plan once I meet the residency requirements without paying another ¥9,800? No, you can't do that. You can't upgrade the data only plan to the data+voice plan. It will be best to wait until you meet the requirements to buy the talkingFAIR. You should be able to get the b-mobile 1-month 1GB data sim for 3480 yen while residency registration is happening and then get a new talkingFair from next month onwards. I think currently the 1GB per month is only a refill option. I'm hoping that changes. It is. From 9/10 you'll be able to buy the initial charge for the price Mkd mentioned. Great news! Thank you so much for this site. Hi, I've been reading your blog for almost a year (since I knew that I was probably coming to Japan for a while) and first of all I would like to thank you for all the work you put into it, and the help it provides people like me. Hello, I've been reading your blog for almost a year now (since I knew I would probably come to Japan), and first of all I would like to thank you for all the hard work you put into this, and all the help you provide to people like me. I have one question though. I know little-to nothing about frequencies, protocols, bands, and "wireless" stuff so I'm not sure if a B-Mobile Talking fair should work properly on my unlocked custom ROM (MIUI) LG Optimus 2x. Using my Spanish MVNO SIM I do catch the DOCOMO JP signal and I'm able to make calls normally. Should I just assume that I will be able to use a B.Mobile SIM and make calls and use data with no problem? I'm sorry if the answer is easy and it is already on the site. I think I read somewhere that someone was able to use the LG 2x with a Fair SIM, and probably it will make no difference with the talking SIM, but still the frequency/band thing scares me a little bit (probably because I don't understand how it works). Again thank you for your blog and your time !! Thank you very much for your reply!! I just ordered the B-Mobile SIM, hopefully I will have it home by the end of the week. I am going to Japan next week and staying for a year. I would like to use a unlocked Samsung Galaxy S3 mini with the b-mobile Talking fair SIM. Can I only purchase it online, or is there a way to buy it in other stores as well (I'll be living in Osaka). How does buying online work with the residency card (since I'll be getting that at the airport already)? I got it online, and at the time (one year ago) it was easy, although all the procedure was in Japanese. A friend of mine got it in Osaka, inside Yodobashi store in Umeda. Just don't forget to take your credit and residency cards with you! I'm going to stay for a year, so I will have a residency card. So that should work fine, shouldn't it? yes, then that will be fine. I'm in Japan now and trying to register for the Talking Fair. What does the "携帯電話番号ポータビリティ" part of the application mean? I don't have a number from which I can transfer.. Could you tell me what this is about? Great site, incredibly useful info and much appreciated. Realistically is voice service needed for employment/social use/anything? I'll be heading over on a working holiday visa for 6-12 months hoping to teach. I talk to most of my friends in Japan on Line message/Line voice/Kakao. Can I get by with just data service?